Note: So I’m camping at Sanborn Skyline Park in Saratoga, California, working on my Nano novel. I can’t say for sure that I will meet the goal of 50,000 words by the end of November, but I’m sure enjoying the process. 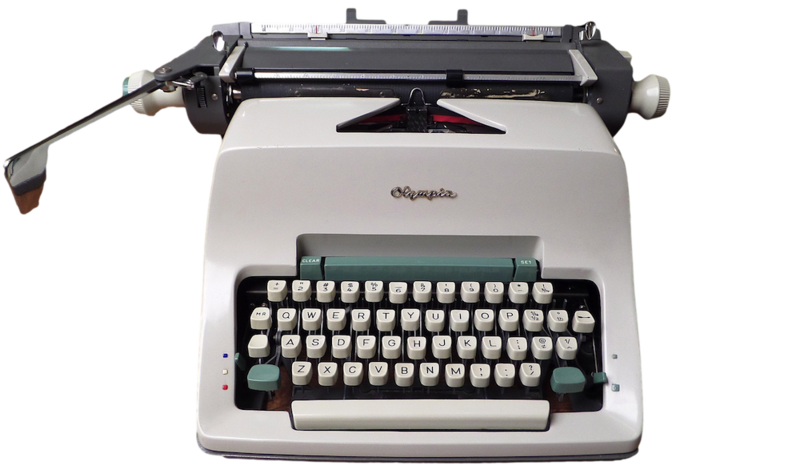 I began the novel, Beings Without Selves, on my recently acquired Olympia typewriter (pictured above), but right now I’m using smaller portables: my Royal Sprite and my Remington 666. Being that I’m consumed with this Nano project, my post on the Olympia machine is a bit abbreviated. At $12.99 at a local thrift store, I could not pass up this Olympia typewriter. It needed basic cleaning — some of the keys stuck — but otherwise it was in fair shape. Typewriters, when in supply, generally sell for $25 at this shop, so this one represented a real deal. Given its size — it’s a behemoth — I can see why it was offered at a discount. It’s hard to find space for a machine like this. That it should turn out to be such a fine typer is the real reward. The text is crisp and the alignment is straight. The typing, though a bit ponderous, is strong. I feel like I’m sitting at the head of a great star cruiser when I type on it. My machine is mostly whole, lacking only paper table extension. Mine came with the dust cover, which is nice, as I’m using this typewriter as a regular machine. I want to keep it in top form, i.e. protected from dust. Aesthetically, I’d say this typewriter is a pleasing machine. Its sloping lines are graceful and modern; its design is quite ingenious. This is the sort of machine one might use in a newsroom, or at home to write a novel. For whatever reason, this typewriter inspires creativity. One last note, does anyone know the model? Sure. It’s an SG3, the last of the big Olympia office machines. Highly regarded. I have one too, and like it a lot. Great design, great execution. A great find! This is an Olympia SG3. 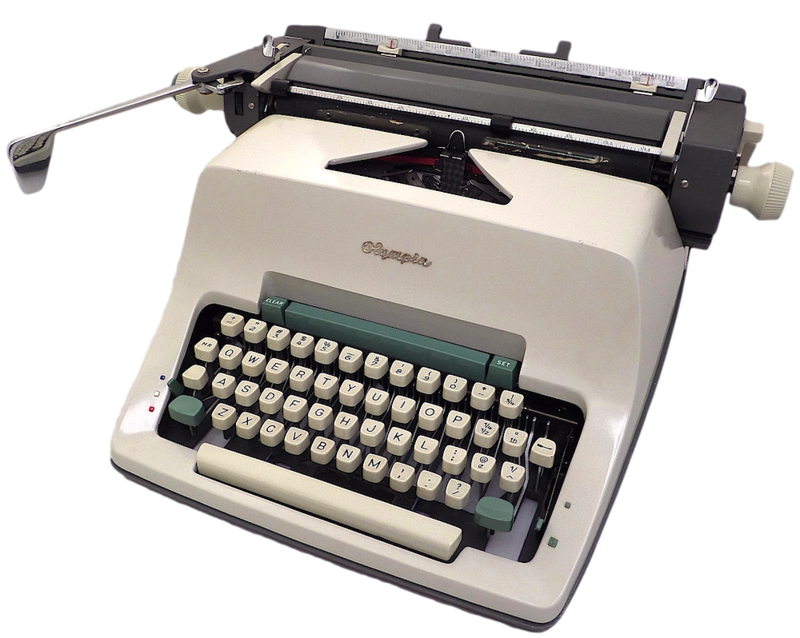 I happen to consider the Olympia SG1 to be the greatest typewriter ever manufactured, followed very closely by the SG3. Then again, if I had found my SG3 first, I may see it the other way round. A fantastic deal on a fantastic typewriter. Good luck with Nano. Sweet ride. If it is in good condition, this guy will be amazing to write on. I thought it was an SG3. It is actually in very good shape, though not perfect (some minor adjustments are needed). It types very nicely, and I plan to post a typecast soon with this machine. P.S. A $12.99 find is certainly lucky, especially given what I’ve paid for other typewriters. Wow, my dad wrote on this machine throughout his advertising copywriting career from the late fifties to the early eighties. When he left the company he’d been with for thirty plus years, in the late eighties, amazingly they insisted he leave his Olympia behind as “company property”! Nice. Anyway he loved that oly so much he went out to probably baltimores last typewriter sales and repair shop, then on north avenue in baltimore city, and told the guy what he was looking for. (Remember this is way pre Internet. I was maybe in my late teens at the time.) they guy kept an eye out and within a couple months, dad had a mint machine even better than the one he’d lost. When he died a few years later, maybe twenty or so years ago, I inherited the “new” oly. I’m sad to say that I haven’t really used it except a few months after I got it during which, in my grief, I wrote long poems in it, now thankfully lost! I’m now working on an art project thing and need to make a tiny tiny version of a typewriter. I plan to use this as my model and your site is absolutely perfect inspiration, thank you. I found an sg3 at a garage sale…..all seemed to be working well on it until it stopped moving forward whenever a key or space bar was pressed…..my son was typing on it when this happened…..could a key have been pressed?